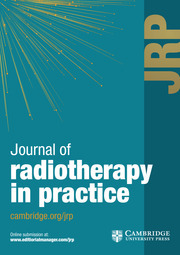 Journal of Radiotherapy in Practice is a peer-reviewed journal covering all of the current modalities specific to clinical oncology and radiotherapy. The journal aims to publish research from a wide range of styles and encourage debate and the exchange of information and opinion from within the field of radiotherapy practice and clinical oncology. The journal also aims to encourage technical evaluations and case studies as well as equipment reviews that will be of interest to an international radiotherapy audience. The role of counselling and communication skills: how can they enhance a patient's ‘first day’ experience?